It’s been close to six years since I started working from home as a copywriter and content manager. It’s also been seven years since becoming a mother. I’ve fit the majority of my virtual career around school, nap, and television hours (a deadline’s a deadline, and sometimes a girl’s got to do what works). Still, I’m happy to say that I’ve been pretty productive — even more so when there’s a lot going on. It wasn’t always that way. Fact: If there’s one thing that forces you to become a better time manager, it’s parenthood. But that’s not to say everyone else can’t learn a few tips from the moms (and dads!) out there. 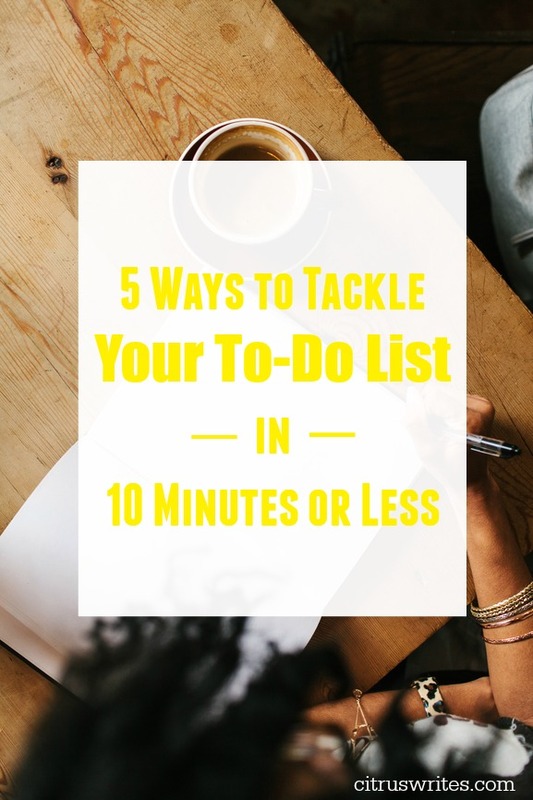 Here are five of the best ways to plough through that to-do list with the limited time you have. What’s on your list today? Take the easiest, shortest tasks and put them at the top of the page. Have ten minutes? Get something done. Pay a bill, send that email you meant to, THEN CHECK IT OFF. Feels good, right? Productivity can have a snowball effect — the more you get done the more you want to get done. So instead of sitting on the couch, look what you did. BOOM. Depending on the day — or the time — your priorities change. Over the course of twelve hours you’re probably pulled in 12 different directions. You may have a pressing deadline, homework to get through with the kids, or an important phone call to make. I get it. We all live the same twenty-four hours in a day, and most of us have too much on our plates. Too much! Take five minutes in the morning and plan out your day (again, I get it. But do the best you can). Will there be a few minutes when you’re waiting for a train, sitting (parked) in your car, or planted on the bleachers watching swim practice? Make sure you have what you need with you — whether that may be your computer, or even just a notebook. When you’re able to make the most of your downtime it’s a win all around. Let’s say you’ve found that perfect pocket of time…and you’ve got the perfect ten minute task. Then, the phone rings. When you’re trying to be productive in a short amount of time it’s so critical to keep the distractions out. It seems obvious, but that may mean turning off your ringer, putting on headphones, hanging a DND sign around your neck, signing completely out of your social media. Whatever it takes. You want to effectively get through a task — right? So you’ve got to focus on just that — the task at hand. I’m sure you’ve seen enough articles telling you what you should be doing before bed to prepare for the following day. Disclosure: I’m a huge proponent of making lunches the night before, clearing the sink, and folding laundry. I’m also dead tired by the time 9:30pm rolls around. If getting it all done seems overwhelming, choose one thing that seems manageable and focus on that. Pay a bill, clear the sink, or set a timer (for ten minutes!) and catch up on a few extra emails. After a couple of days see what else you can get done in limited time. Your process will become more efficient as you start to make it a habit. Before bed is a great time to take stock of how you did. Revise tomorrow’s list, move those easy tasks up to the top, and cross off everything you were able to get done. Most importantly, give yourself a pat on the back.